Finneus flat out “brings it” every time out… Whether it’s an intimate nightclub, or a thousand-seat theater, these Chicago music scene veterans bring an undeniable energy to the venue. Witnesses to a Finneus show have been known to display symptoms of singing along, dancing onstage, on the bar, or anywhere there’s room to dip, shake and put the freak on. With nearly 100 years combined experience in the music industry, Finneus are well respected pros. Finneus caters its setlist to meet the crowd’s expectations every time. Finneus has always taken a different approach to performing cover songs. Our catalog certainly focuses on rock, but often strays into country, rap, etc as well as covering everything from the 60’s to the music of today. There is always something for everyone at a Finneus show. “I can’t believe you guys played that song, that was awesome” is a common comment. Continuously delivering their prolific catalog throughout the Midwest, Finneus’ special blend of finneus-ized (funked-up) cover songs, while throwing an occasional groove oriented original music into the mix for good measure. Finneus specializes in taking songs you know and making them “just a little bit better” or “throwing some songs in the blender”. This recipe has earned Finneus a die-hard following. Local and regional radio stations have consistently embraced Finneus’ original releases. It only makes sense given the radio friendly style of Finneus’ original efforts. ‘Translucent’ (2003) and ‘Superstar and a Ballerina’ (2006) enjoyed regular rotation on a number of local stations after their releases. Word is quickly spreading about their most recent release, “Enjoy the Ride” (2015), on which they collaborated with the well known engineer Chicago Frank Pappalardo. Finneus is a hard-working, professional band bringing their A-Game for high quality entertainment every time out. We pride ourselves in delivering exactly what the venue calls for, catering the setlist to the audience, and keeping them engaged every time out. What is next for these hometown heroes? 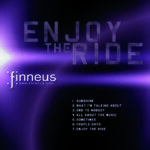 To quote one of the songs from 2015’s “Enjoy the Ride” album, “Its All About the Music”… Finneus has been together for 20+ years because they are avid musicians, who are having fun, helping people have fun.